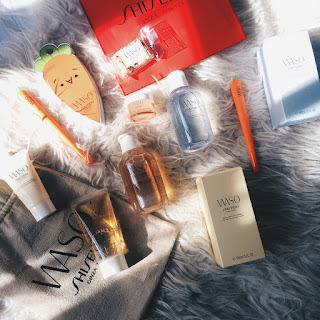 Shiseido Waso Line: Review/First Impression of Few Products from the Line! 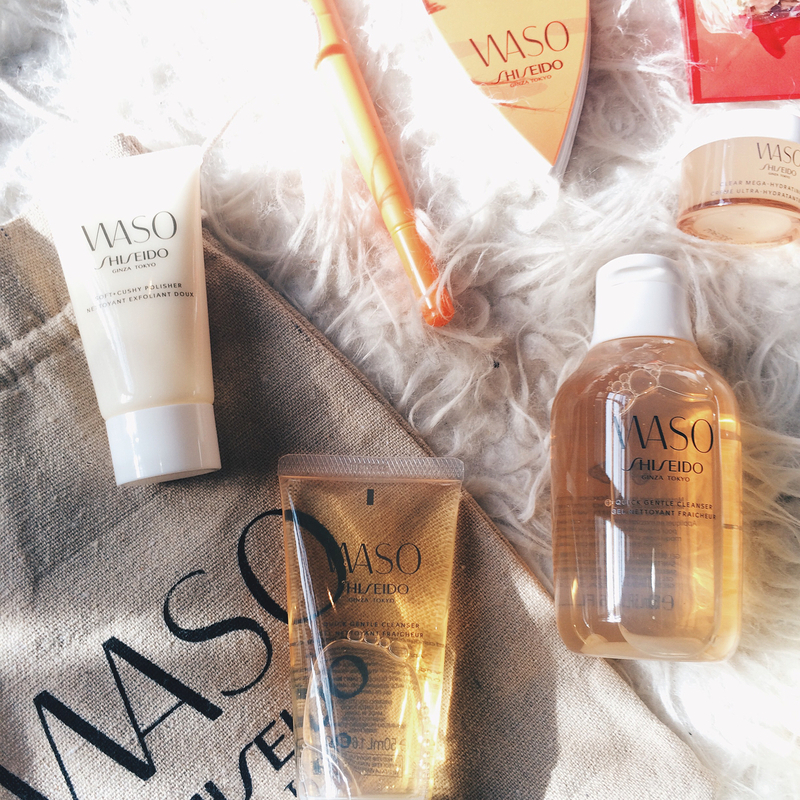 The Waso line is just introduced to Malaysia, and I'm just drawn to whole chic and minimal packaging! 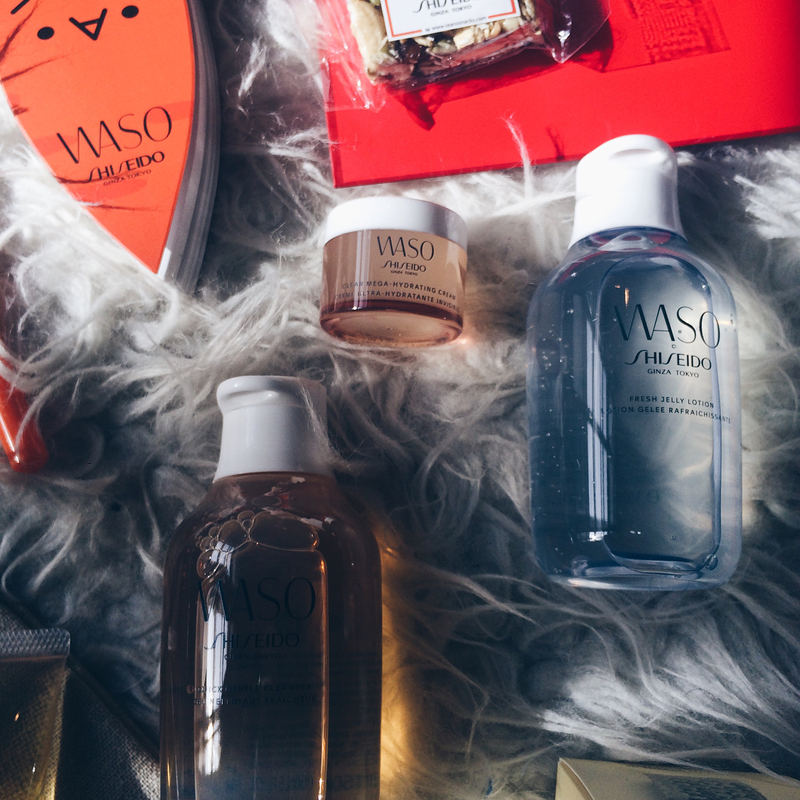 The Waso line is designed for millenials, with good wholesome key ingredients and on the go packaging/function. It utilizes the concept of Washoku, which is a Japanese cuisine philosophy of preparing an ingredient to maximize the flavor and benefit of the ingredient. @shiseidomalaysiaWaso line is having a roadshow at MidValley Megamall so I asked my bf to get me the roadshow exclusive set called Free to be Me. In the kit there's a full size and trial size of the Quick Gentle Cleanser, a full size of the Fresh Jelly Lotion, a trial size of Soft + Cushy Polisher and a trial size of Clear Mega Hydrating Cream. I also got a sample of the Color Smart Day Moisturizer that is not pictured here. Apart from what I've tried here, there are other products in the line that I might try in the future. Those products are the Smart Color Day Moisturizer Oil Free (ordered and waiting for it to come!) and the Quick Matte Moisturizer Oil Free. I will review/ make a post of first impression of them if I got my hands on them. a non-foaming really gentle cleanser with honey and royal jelly. pH is 4-5, and doesn't feel stripping at all. It smells like hotel shower gel but really pleasant lolol. Great cleanser with not so great price point 😭; definitely dupable. Update: Found out that this contains SLS, which might be a little harsh on some skin. The scrub is okay-ish, but not as soft as Skinfood Rice Wash Off Mask. It works but I prefer the Skinfood, both for the price, value and feel on the skin. Update: Contains Alcohol Denat which might be a little drying for some folks. a gel type lotion that transform into lotion for an ultimate shot of hydration. The key ingredient is white jelly mushroom. The gel is really soothing and your skin just drinks up the hydration. It absorbs fast and there is none of those icky sticky feeling. Wonderful lotion, though I have a feeling it's dupable. Not sure if it's similar to Son & Park Beauty Gel. Smells fresh and really pleasant without being overwhelming. Usage: Use after cleanser/scrub as a toning/essence step. Squeeze a dime sized amount on cotton pad or palm and smooth over face. Update: This one is alcohol-free! 🐰Clear Mega Hydrating Cream: This gel cream is formulated with whole carrot, and omg I'm so in love with this firm gel that I'm gonna get a full size when I ran out of this. It's pretty hydrating and just plumps up my face, but it's so lightweight and it doesn't even feel like I'm wearing any cream except that my skin is hydrated! I was looking for a silicone-y moisturizer and this is the ONE for me. Caveat: contains alcohol and silicone, which I'm fine with. Usage: Use as the last step of day/evening routine. Take two pearl sized drops and smooth over skin, can be used on top of makeup. 🍐Color Smart Day Moisturizer: This color changing moisturizer has spf30 and is great for quick errand/indoor use. It looks like my skin but better, acne scarred and all but fresh :) I like the concept of it that I ordered the oil free version! Usage: As the last step of your day routine (I use this after the Mega Hydrating Cream as this contain SPF, but since the cream can be used on top of makeup, I doubt there is much difference). Take two pearl sized drops and smooth over skin. I do a small circular motion to blend the shade to my skin.